Some Partiko users are experiencing issues with Partiko today, where they can't load content normally and their Partiko Points are not correctly reflected after watch ads. We would like to report to you that this is an internet-wide issue caused by Cloudflare and a lot of other services are affected as well. The founder of Partiko @crypto.talk was unable to make food orders on Doordash because of this! The issue is that the API response from Cloudflare includes wrong header, and makes Partiko mistakenly cache the response on the device. That's why a lot of people can't see their latest post even after refresh. To fix the issue, we have already went ahead and stopped using Cloudflare. If you were asleep while this happened, chances are that you won't even be affected. 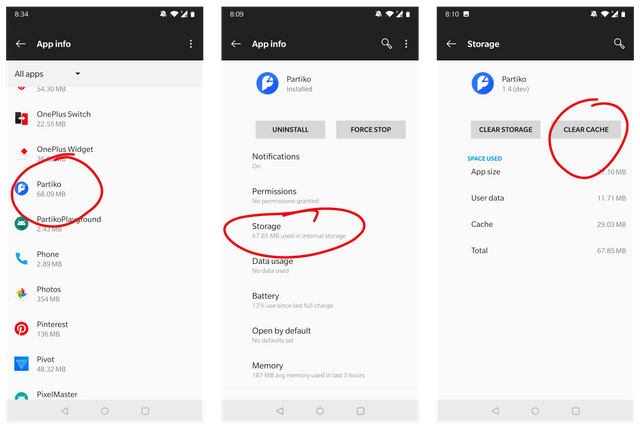 For Partiko iOS users, unfortunately there's no option to clear the cache. Therefore you would need to uninstall Partiko and reinstall it to fix the issue. Although this is not our mistake, we feel deeply sorry for your loss. Therefore, if you have experienced the issue and have to go through the steps above to fix it, we will be more than happy to send you 1000 Points to make up for your loss! I didn't have problem here, but i will resteem and would be happy to win 1000 partiko points too. Resteemed this article for the #Japanese community. Really sorry for your loss! It's working now. Thanks for all the effort you guys are doing! I haven't cleared the cache and is working fine, if I have issues I know what to do. Keep it up! Hello! Thanks for the question! That's photo cache. no worries.. we don't live in a perfect world. No problem. Onwards and Upwards with Partiko! Have you tried the fix above? I just didn’t use the app for a few hours, then everything worked fine again 😅. Yup still affected. Thanks for the solution. Will go clear cache now..
OK! Sorry about the inconvenience! No worries. Glad it is back. Started getting used to the app. Miss it when it’s gone. Oh! I had this problem twice last night! The points for watching all the advertisements did not come up! And the App just stopped working. So, I had to delete the App and reinstall twice last night and once this morning. I hope this problem is behind us and that things will be as smooth as usual. Thank you for informing us about the causes of this strange freeze up of the App. And for offering to compensate those who have suffered some losses. Need to uninstall I guess. I had watched a couple ads and did not receive any points was wondering what was going on. Thanks for addressing the issue right away and the 1,000 points for the inconvenience that is awesome of you guys. Could you tell us what issue you are still having? Thanks! I quickly went on Discord to see what was going on. Thanks for updating us, everything works fine again for me now. Oh man! This is the problem. Thanks for the update. I'm experiencing it too. I only can see my post on Steemit page not partiko. But still receive comment and vote updates from partiko for that post. Hi guys I have cleared my cache, and it seems to work again. I'm just not getting notifications from the app any more? You should get notifications. Did this one work? Thanks @partiko. I have been facing this issue but thanks for the important update. Actually, I've had a problem from day one, but it wasn't the point system. Every time I reply, the app says I've "timed out". Then it makes me think that I didn't reply because it doesn't show up. And so I reply again, and then take a look, and there are two replies! This should have been fixed a while ago. Are you still seeing this issue? Yes, I am still seeing the error message 8 out of 10 times. I'm using a LG V20 cell phone. So I copy the message before sending it, or I have to rewrite again sometimes. Got it! Which country are you located in, if you don't mind telling us? Thanks for this @partiko. I was wondering what the problem was lol. I had problems with voting also. Reeeeesteeeeeeemed! Reinstall worked thanks! Some strange issues happening lately with hosted servers. Yes I usually always clear my cache every alternate day, but this morning even with cache cleared I was not able to check in or earn points until about an hour ago. Sigh. Really sorry about the inconvenience! Will you consider implementing option of transferring Partiko points to another Partiko user in future? That explains why it is not working on iOS. To remove the program and add again? Test again. After delete and install. After done that now working. Thanks for the update! Really sorry about the inconvenience! You made more than 90000 comments. Your next target is to reach 91000 comments. Every time I tried upvote , I have to pull down at points to update the numbers. Is this normal? I resteem this post partiko today morning time I face problem but this time all is well I appreciate my personal felling better app for me. Had a lot of issues with it to be fair this morning but have cleared the cache and hopefully that gets it going again. Still having a few delays trying to comment or vote but notifications and posts are working fine again. I can use all of the apps features again but need sometimes trying to comment or vote it takes a few tries for it to be accepted. Comment and vote delays are usually caused by the Steem network being busy. Thank you so much for letting us know! While the original problem cleared up for me, I can't now get confirmation of my posts and reward claims. Instead, I get timeouts. My posts are then visible to me and I get messages that I've already claimed my rewards. Another problem: When I try to make a new post, Partiko sends me to edit my previous post. BTW, my rewards now show as claimed. Hello! You can clear your previous post so that you can make a new one. Let us know if it works for you! Cache clearing fixed my balance, but my history isn't updating yet. Thank you so much! Really sorry about the inconvenience! It worked, thanks so much guys. No worries! Thank you so much for your patience! Great Help!! Thanks a lot!!! Of course! Really sorry about the inconvenience! Thanks for the quick response, fast fix & update, and overall great communication. I feel like I'm a fanboy of you guys because of how many times I gush over how great you all are doing. Thanks for the info and giving us a workaround - I wondered what was wrong yesterday. You guys are on the ball with keeping us updated! I thought I wasn't affected, but today I see that the comments I made last night using Partiko did not post, and are not on the blockchain today. Guess I'll do the clear cache thing now. Sure thing! Really sorry about the inconvenience! Issues or not, Partiko is awesome! I couldn’t load new notifications and posts yesterday but is working fine now. Thank you so much for the update! Really sorry about the inconvenience! I think your App still has some problems. I just watched two advertisements on games but there were no bonus points to my account. I think something just got hank! This happens sometime and has nothing to do with the cloudflare issue. You can try to close the app, close it in background and reopen it. No. It doesn’t work for iPhone, perhaps. I think I know what happens now: the box was saying ‘one more left’, i played the same old vid three times but there was no notification about 50 points earned! Hope this is making some sense!? Something not complete with the software code!? The free point box should be updated after you finish watch a video. If that's not the case, you can try to uninstall and reinstall Partiko. That will fix the issue. And you only need to do it one time. Thanks for your reply. Hope iPhone can post more than one photo soon and the date-time of posting can be real time soon. I had to uninstall it and then reinstall it, working fine now! Glad to see the issue resolved so fast. I need my #Partiko points! I was struggling with it last night but it seems OK today, didn't have to clear the cache. I will uninstall and reinstall.... thanks. Really sorry for the trouble! I’m using iOS version and it’s okay 👌. I. experienced it yesterday for how many couple of hours. This time, it's OK. I cleared the cache on my Samsung S8 but it is still not possible to click the 'free points' button with '10 times left'.... it just makes a red dot appear and disappear in the top right corner of the box. Any ideas? Were you able to see the ads before? Had lots of problems with this yesterday. I ended up using the Steemit website for the first time in ages. Ewww. Hope things are OK now! Yep. All fine. Hey, have you thought about introducing a flag/ downvote option into Partiko? Sometimes I just need to hit someone with a negative vote. Es como una gran oportunidad y a la vez es una significativa competencia.